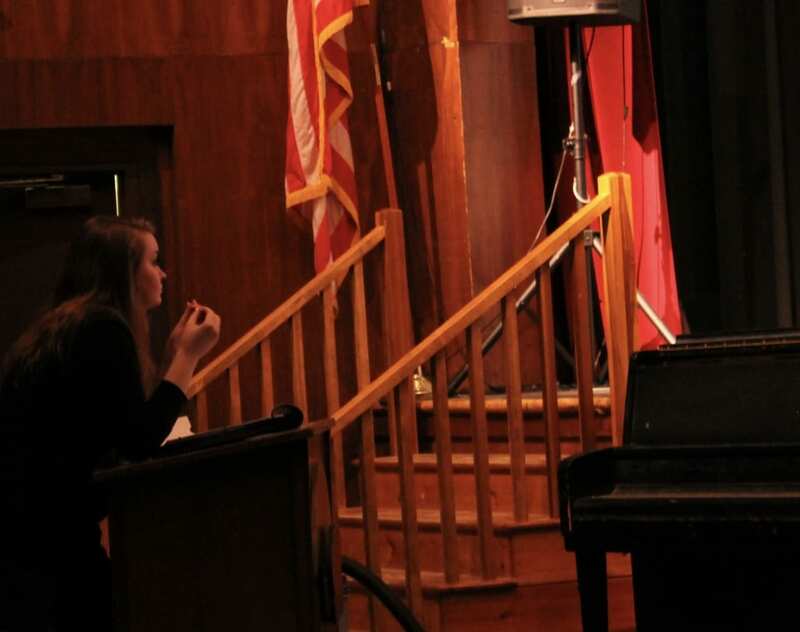 With her face almost glowing from the stage lighting, Director Alison Rose watches the Spaulding High School students rehearse scenes from their spring performance of “The Sound of Music” with cheerful yet focused attention. As the lights go out, two nuns appear on stage with arms full of props. She has the kind of face that looks friendly even when she’s giving an order. Her voice is clear and direct. 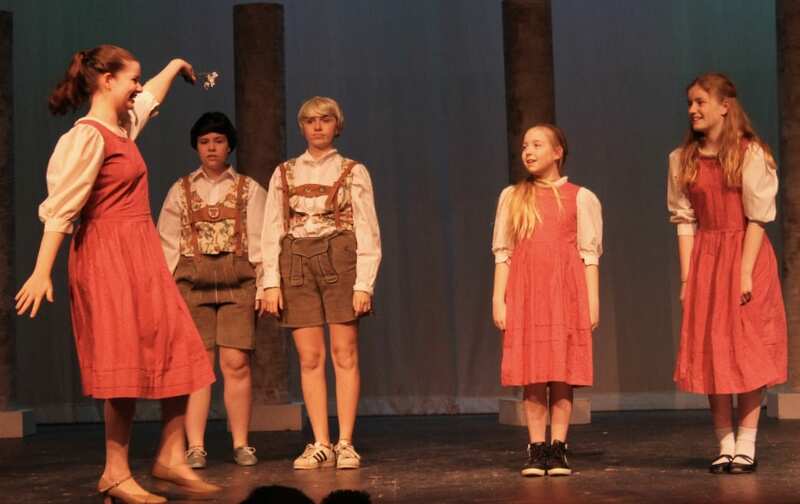 “The Sound of Music,” which runs April 5th, April 6th, and April 7th at 7PM and 2PM on April 7th, is the fourth show that Rose has directed at Spaulding. It is also her second musical. Directing theatrical performances at her alma mater, however, was not what she originally had planned to do. However, last year, her sister Shannon, at the time, a senior, had heard that the school was looking for someone to direct. Rose was in the process of returning from Southern Virginia University when her sister told her that the school wanted her to direct. They did ask her and without any experience and with much excitement, she said yes. It wasn’t the only commitment she said yes to. Initially, she had planned to move to Massachusetts and live with her sister and find a job in Boston in editing or proofreading. But after accepting the job, she decided to stay until at least December. But then she went to a potluck at her church and met the man who was to be her husband. 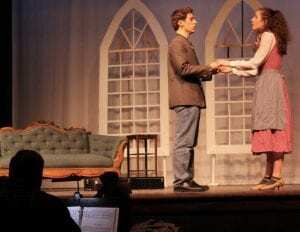 Within the first month of her doing “Crucible,” her first show, she became engaged and in August 2017, married. “I had a whole other dream for my life and I ended up here.” When Rose says this, she smiles and shakes her head, as if surprised by the notion that returning home could offer her a new, even better dream. But Rose is different. She’ll tell them to move there and then give them the reason behind it. If they don’t give the emotion and reaction needed, she talks them through it. 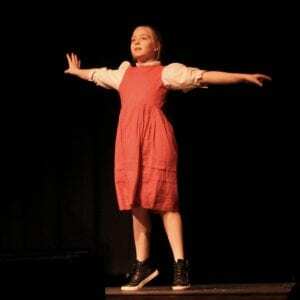 Liesl, played by junior MJ Chouinard dances out onto stage after Brigitta. Her students appreciate this approach. According to MJ Chouinard, a junior who plays Liesl, one of the best parts of doing “The Sound of Music” is having Rose as the director. 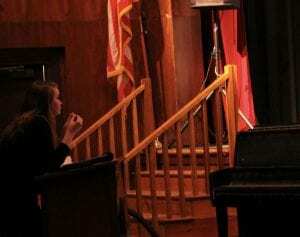 Maria, played by Spaulding Senior Kat Norwood and the Captain, played by senior Jeff Steinman. Xander Little, a junior who plays Rolf, said Rose is “very descriptive about what she wants people to do, but also very open to how people want to portray their character.” This, in a way, allows the students to really make their characters their own. When students feel they are heard and accepted, it creates a welcoming and supportive community. Jeff Steinman, who is a senior and plays the Captain, explains that “There’s a place for everyone. I’m not a great dancer! But I’m still here.” He laughs as Kat Norwood, who is also a senior and plays Maria sits beside him and nods, adding “Our directors see the potential in every student and know what they can work with. They’re skilled to train and learn these things. If you’re not that confident in singing, they’ll coach you.” And even if one weren’t interested in performing, there are plenty of opportunities to be involved with the costumes, set, and tech. And it’s amazing what the power of an accepting community can do. Xander on the other hand, feels a little nervous this time. And it’s because it will be the first time in a show that he will be singing alone. Good thing he has his sister, 6th grader Ariyana Little, who is playing Brigitta, there to support him. And he in turn, supports her, by helping her remember her lines. Brigitta, played by 6th grader Ariyana Little dances out on stage during Thursday’s dress rehearsal. “It’s scary when you mess up” Ariyana explains. But she also doesn’t feel the stage fright. It is likely she will channel the same courage and fierceness she had in Barre Town’s performance of the “Lion King” (Ariana played a lioness) into her performance as Brigitta. When it comes to “The Sound of Music,” both Xander and MJ were unsure how they’d be able to live up to the expectations of their characters. But they made the roles their own, as did the other students, and now feel more confident.